While other girls played with dolls, Maria would choose to make clothing and hats for her toys. She learned how to use a sewing machine in Home Economics class and things took off from there. 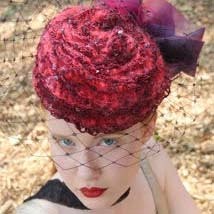 Although she always wore a hat, once Maria attended art school, expanding her color palette, her hat designs took on a more dramatic flair. She purchased new and old vintage hats to mix and match along with the addition of her personal embellishments to create unique chapeaux. Then it was time to take on more concentrated courses at F.I.T. After the F.I.T. class, she studied with numerous millinery teachers in the U.S., learning different techniques, styles, and fabrics along the way. 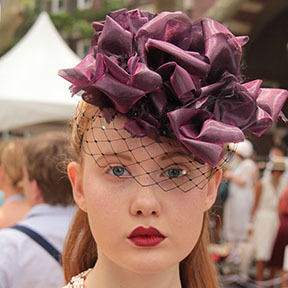 Through hard work and perseverance, Maria's style and millinery sense continues to evolve. The right hat can go anywhere at any time, day or night. Everyone can wear a hat! Everyone can look good in a hat! You have to search for the hat of your dreams and find the hat that fits your face and personality. Maria at Maria K Hats..."My mission is to arm the world with hats for every head".